Joe Tusa established himself as a giant in Houston Independent School District Athletics, and now, his dedication to the school district will be recognized for generations to come. 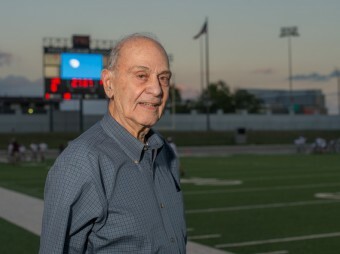 HISD will honor the 85-year-old former HISD Athletics Director by re-naming Delmar Stadium and Delmar Field House, to Delmar-Tusa, during halftime of the Reagan-Waltrip Football Game at 6 p.m. Saturday at the stadium. The Delmar athletic facilities were built in 1958, which was Tusa’s second-to-last season as a coach. The Houston Heights native guided the 1958 and 1959 Bulldog teams to the state quarterfinals. The Delmar facilities may be rebuilt if the school bond passes, but the new facilities will also bear Tusa’s name, said HISD athletics director Marmion Dambrino. The Reagan-Waltrip game was selected because Tusa has a connection to both schools. He graduated from Reagan in 1945 and coached there until 1960. When Waltrip opened in 1960, he became an assistant principal there until 1965 when he was named district athletics director, a position he held until 1989. Tusa said many of the players from his ’58 and ’59 Reagan football teams are expected to join him at the dedication ceremony on Saturday. Tusa and his wife, Margaret, operated a ranch in East Texas until 2004. The couple, who lives in Timbergrove, is now retired. Tusa’s accomplishments as HISD’s athletic director went far beyond the district’s on the field success. HISD schools won several state championships in a wide variety of sports, and both Barnett and Butler athletic facilities were built during his tenure. But his most impressive feat was overseeing racial integration and the addition of girls sports, in HISD Athletics. HISD integrated in 1968, and Tusa worked with colleagues to ensure that it would go smoothly. HISD had a girls athletics program but it was expanded in the early 1970’s after Title IX passed. Tusa was involved with the national high school athletics director organization and served as its president in 1974. He was also instrumental in establishing the Texas High School Athletic Directors Association and is a member of their Hall of Fame. Tusa graduated from Reagan in 1945, and he was a wide receiver/defensive end for the Bulldogs’ football team. He enlisted in the U.S. Navy right after high school because World War II was still going on. WWII ended before Tusa was ever deployed overseas. He played football for Rice University, and later the University of Houston. He earned a Bachelor’s and Masters degree from U of H.
Tusa taught physical education and coached just about every sport at Reagan, but he was best known for leading the football team to a pair of state quarterfinals in 1958 and 1959, respectively. The current group of Bulldogs has a chance to win eight games for the first time since Tusa’s ’59 team. In 1960, Tusa decided to go into administration and helped open Waltrip.